Just look at this tiny bar, so cute, and so sweet. My friend brought a bag of these back from Italy. They are coated in creamy, European milk chocolate, with just the faintest hint of coffee. Inside there is a crispy filling. A nice candy all the way around. I love how the mini bar has 6 sections, as if I’d break off a few at a time. Ha, it is the perfect bite-size. You can find this brand at World Market here in the U.S. 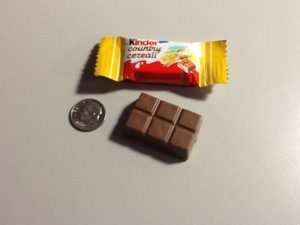 The only odd thing about this candy is the name “Kinder Country”. I guess it gets lost in translation. that is an odd name. I envy Europeans their candy bar options. Way better than ours–my opinion. the company Kinder (think it is like “kinder”garden) also makes something called Kinder Surprise, a little hollow chocolate egg with a teeny tiny toy surprise inside (perfect to choke on) My daughter loved these when she was younger. the toys were always just this side of being a little weird – strange slightly sinister looking knock offs of Mickey Mouse, a small distorted plastic frog, an even smaller blue race car that had to be assembled with even smaller parts…that sort of thing…the chocolate was quite yummy, though.